Our PVC flex hose comes in 50' rolls. 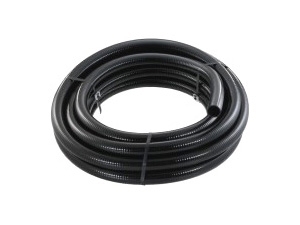 Flexible PVC hose makes installations easier by eliminating elbows and 45's. It also reduces piping losses making your pumps more efficient. Use this pipe in tight areas to eliminate elbows and improve flow rates. All sizes are standard PVC outside diameter and accept all PVC glue fittings. No special glue required. Reduced installation time and fittings. Black color makes it easy to hide.